How the festival of lights can add a glow to your financial future? 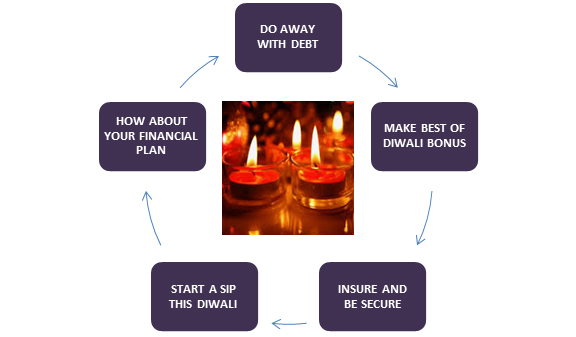 We enumerate five ways in which you can add a glow to your financial future this Diwali. Diwali or the festival of lights is one of the most auspicious celebrations for Hindus in India and across the world. Diwali marks the return of Lord Ram, Sita, and Lakshman to the Kingdom of Ayodhya. The entire kingdom was lit up to mark the return of their beloved king. For most Hindus, Diwali has a much larger significance. It is a reminder that the right path always triumphs. More importantly, the light denotes hope that burns eternal in the human heart. Human life sustains on hope and triumphs on effort. It is this hope that Lord Ram signifies, and it is this very hope that the lights (diyas) also signify. Apart from its mythological moorings and its philosophical implications, Diwali is also considered the right time to begin doing the right things. Diwali marks the beginning of new ventures (as signified by Chopda Pujan in Western India), especially for traders, stock brokers, and investors. Diwali also marks a surge in expenses and a time to invest in assets that can create wealth in the future. Let us now look at five ways in which this Diwali can add glow to your financial future. It is quite easy nowadays to run up debt. You have a credit card with liberal limits, and you also have personal loans and consumer loans to fulfil your Diwali needs. More often than not, these can be long-term traps if not managed properly. Ensure that you do not run up a huge debt this Diwali, especially if you are going to pay steep rates of interest as is the case with credit cards and personal loans. The so-called easy credit does not come easily and imposes a huge cost on you over time. This pledge you must not only make for your current Diwali expenses but also to ensure that you try and repay any old high-cost debt in your books. Quite often, debt reduction is the most productive investment. Getting a Diwali bonus is quite common in India. 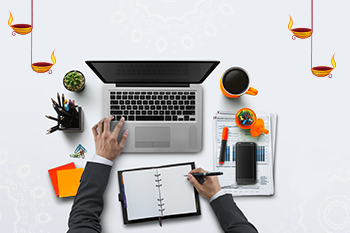 Most employers try and time their bonuses around Diwali to enable employees to manage their expenses better. If you have done really well this year and are getting a liberal bonus, you must look to make the best of it, not only in terms of reducing your debt but also looking at other avenues like insurance, investing, long term savings, etc. At the end of day, savings is what we squeeze out of our incomes, and there is no better opportunity than starting that discipline with your Diwali bonus. You may believe that you are adequately insured, but hard numbers need to be considered. For example, imagine that your monthly expenses are Rs1 lakh. In order to earn that kind of money in a liquid fund in your absence, your family will require an insurance corpus of nothing less than Rs2cr. Get value for your money this Diwali. If you are going for a life cover, then opt for a term policy, and if it is a medical cover, try out a family floater. These will obviously be more economical and will also serve your purpose adequately. A systematic investment plan (SIP) is all about discipline. Use this Diwali as an opportunity either to start a fresh SIP or to enhance your SIP investments. Even a small investment of Rs5,000 can grow substantially when you are doing an equity SIP. Equity SIPs over a longer time frame are amazingly effective wealth creators. Let us consider an example. A monthly SIP in an equity fund earning CAGR of just 14% can grow to Rs65.8 lakhs in 20 years, which is nearly 5.5 times the amount you invest. If you extend the same SIP at the same CAGR to 30 years instead of 20 years, you create a wealth of Rs2.78cr, which is 15 times the amount you invested. That is the power of compounding and no better time to embark upon a bigger SIP outlay than this Diwali. In fact, that is where it should ideally begin. You start with your long-term financial goals in mind and then work backward toward the investments required and the asset mix. The earlier you start with your financial plan exercise, the more time you have to plan your goals, and you have greater opportunities for taking corrective action where required. This Diwali, sit down with a financial advisor, craft a plan, and begin investing. That may be the best Diwali gift you can give yourself.